Trip 4. From Gozd Martuljek to Mahovi-Moss, Jasenje and back. 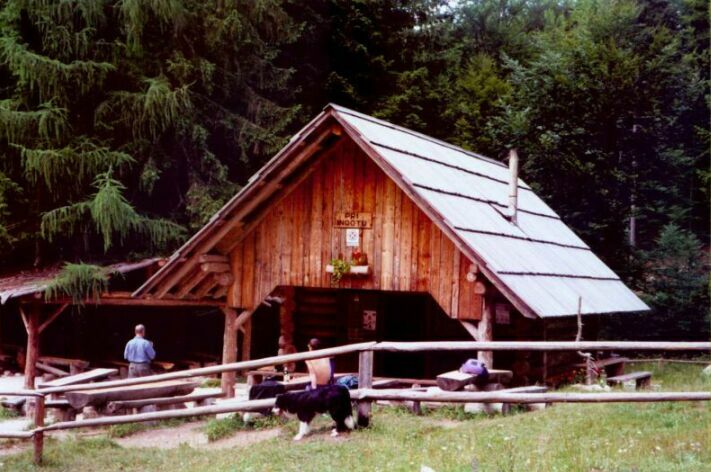 We shall begin our trip at the village Gozd Martuljek /old pension Špik /. After some minutes of walking we have to decide where to go: through the canyon of the stream Martuljšèica or we shall take the way designed on the map. The way through the canyon is more beautiful but on your own risk, because sometimes exists the possibility of falling stones from slope and also the way is a little problematic. The stream of Martuljšèica is changing his river bed from time to time. 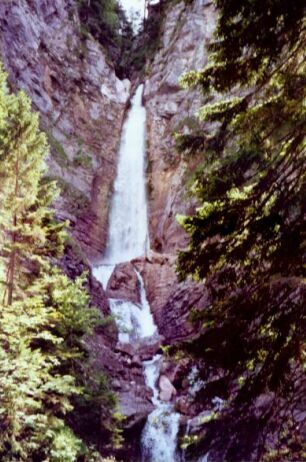 After 30 minutes of walking we reach the first waterfall. The view is terrific. 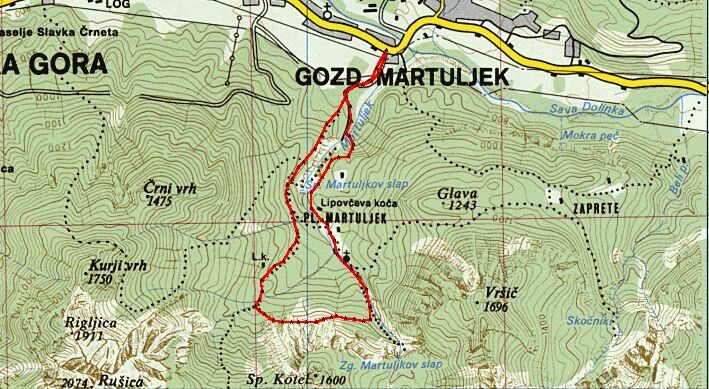 From the first waterfall the path is very pleasant without any great effort till the signature Pod Špik and we take the signed direction. The walking is nice and soon we come to the little desk. Here we cross the torrent (left) and after abt. 150 m we can see the stone man and another on our left side. From there the path is visible very good and without troubles we reach the natural place worth seeing - Mahovi ( the mossy river bed ). 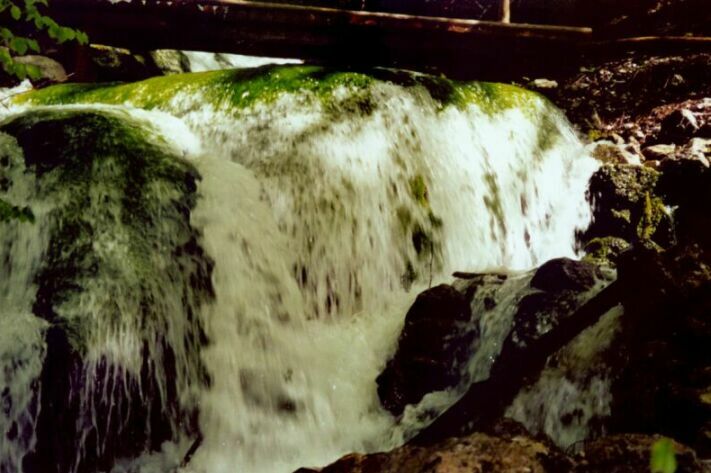 The best view is when the water runs over the moss. In the hot summer time there is no water but we can hear the rumbling inside the stony wall. The path leads us to the marked way for the second waterfall. It is up to us to decide to see the second one ( abt 20 minutes) or to take the descent to Ingo's hut, where we shall have the opportunity to eat and drink many good things. From Ingo's hut we can continue our way down on marked path or we can pass the Lipovec hut( on our right side). In this case the descent is more alpine - not suitable for children under 10 years. The trip is suitable for all hikers and it lasts about 5 hours incl. rests. The relative altitude is abt. 250 m and the length is abt. 6 km. The arriving to the initial place should be with car. Parking is not problematic.